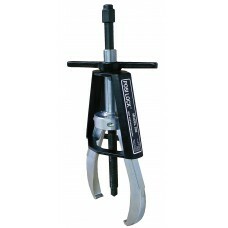 Manual puller with two jaws for extraction of most shaft-fitted parts, including bearings, wheels, bushings, gears, and pulleys. Two-jaw construction for working in compact spaces. Forged steel jaws for increased strength over investment casting. 12-ton pulling capacity, 8" (203 mm) reach and a spread range of 0.75 to 12 inches (19 to 305 mm) for increased pulling leverage. Tapered jaws for better access in tight spaces. The Posi Lock 208 manual puller has a 12-ton pulling capacity, it has two jaws for working in compact spaces, & is suitable for extracting shaft-fitted parts, including bearings, wheels, bushings, gears, & pulleys. Its jaws are made of forged steel for increased strength over investment casting, & are tapered for better access in tight spaces. The center bolt has a 0.75" (19 mm) diameter. The diameter of the center bolt must be at least half the diameter of the shaft along which the object is pulled. This puller has an 8" (203 mm) reach and a spread range of 0.75 to 12 inches (19 to 305 mm) for increased pulling leverage. 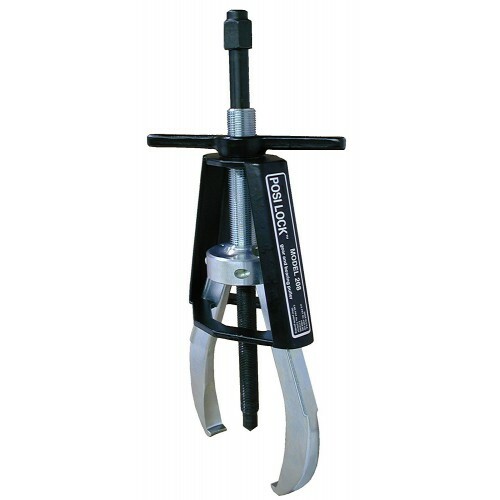 This manual puller is suitable for extracting shaft-fitted parts in a range of industries, including automotive, HVAC, wind power, and others.